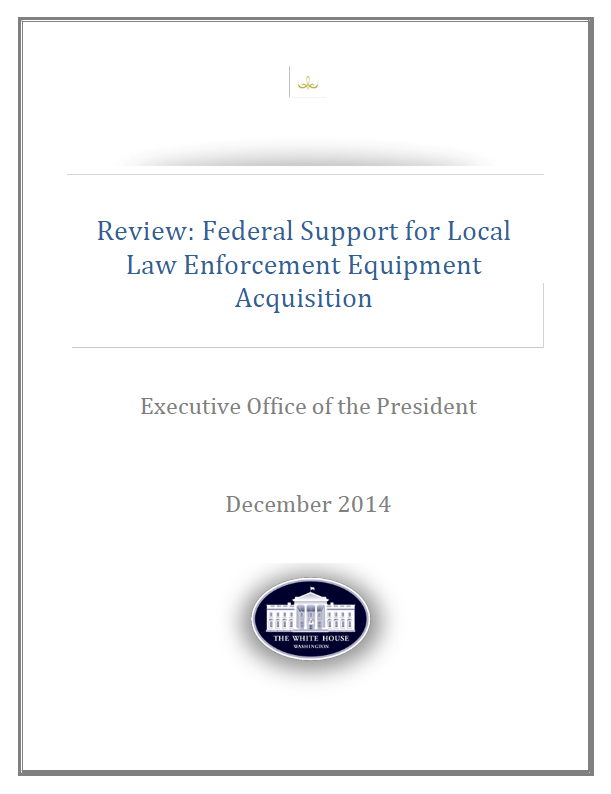 The following review of federal support programs for local law enforcement equipment acquisition was released December 1, 2014 by the White House. For decades, the federal government has provided billions of dollars in equipment to state and local law enforcement agencies (LEAs) through excess equipment transfers, asset forfeiture programs and federal grants. Particularly in the years since September 11, 2001, Congress and the Executive Branch have steadily increased spending and support for these programs, in light of legitimate concerns about the growing threat of terrorism, shrinking local budgets, and the relative ease with which some criminals are able to obtain high-powered weapons. These programs have significantly expanded over decades across multiple federal agencies without, at times, a commensurate growth in the infrastructure required to standardize procedures governing the flow of equipment from the federal government to LEAs. At the same time, training has not been institutionalized, specifically with respect to civil rights and civil liberties protections, or the safe use of equipment received through the federal government. Concerns over the lack of consistent protections have received renewed focus and attention in light of the recent unrest in Ferguson, Missouri. The White House has engaged federal agencies, law enforcement stakeholders, civil rights stakeholders and academics in conducting a review of federal funding and programs that provide equipment to state and local LEAs. During the course of this review, White House components have explored whether existing federal programs: 1) provide LEAs with equipment that is appropriate to the needs of their communities, 2) ensure that LEAs are properly trained to employ the equipment they obtain, and 3) encourage LEAs to adopt organizational and operational practices and standards that prevent misuse/abuse of the equipment. Between FY2009 and FY2014, the federal government provided nearly $18 billion dollars in funds and resources to support programs that provide equipment and tactical resources to state and local LEAs. LEAs can acquire equipment through various programs administered by the Departments of Justice (DOJ), Defense (DOD), Homeland Security (DHS), Treasury (Treasury), and the Office of National Drug Control Policy (ONDCP).1 DOJ, DHS and ONDCP directly fund equipment purchases through multiple grant programs. DOD manages the transfer of excess equipment and also helps LEAs obtain new equipment at lower DOD prices. Additionally, DOJ and Treasury fund equipment purchases and other law enforcement activities through the equitable sharing component of the federal asset forfeiture programs. These programs, in the main, have been valuable and have provided state and local law enforcement with needed assistance as they carry out their critical missions in helping to keep the American people safe. The bulk of the equipment transferred from federal sources to LEAs is fairly routine—office furniture, computers and other technological equipment, personal protective equipment and basic firearms. But federal agencies also transfer, or fund the purchase of, military equipment, including high powered weapons and tactical vehicles. Although such tactical equipment constitutes a small percentage of the total material that flows from the federal government to LEAs, it is nonetheless substantial. For example, under the DOD 1033 program, only 4% of the property provided to LEAs last year was “controlled property” (property listed on the Department of State Munitions Control List or Department of Commerce Control List). However, this 4% translates into 78,000 pieces of controlled equipment transferred from DOD to LEAs. To date, approximately 460,000 pieces of controlled property are currently in the possession of LEAs across the country. Despite the fact that federal equipment and purchasing programs generally share some of the same goals, each operates independently from the others and the policies and practices by which they are governed vary widely. When shared goals exist, it may be preferable to establish some common standards and practices. With respect to commonality, for instance, the lists of permissible equipment vary across programs, and each program employs different oversight and auditing procedures. They differ not only in the kind of reporting required by LEAs, but also in the frequency of reporting and level of detail required. These programs also vary in the type of training—if any—they require of LEAs. For example, the programs reviewed do not necessarily foster or require civil rights/civil liberties training and they generally lack mechanisms to hold LEAs accountable for the misuse or misapplication of equipment. This variation among federal agencies makes tracking the overall effects, use and misuse of federal or federally-funded equipment difficult. Given the lack of consistency in how federal programs are structured, implemented and audited, and informed by conversations with stakeholders, four areas of further focus have emerged that could better ensure the appropriate use of federal programs to maximize the safety and security of police officers and the communities they serve: 1) Local Community Engagement, 2) Federal Coordination and Oversight, 3) Training Requirements, and 4) The Community Policing Model. Both law enforcement and civil rights stakeholders agreed that there is often insufficient transparency to decisions surrounding the acquisition of equipment. These programs often permit LEAs to request equipment outside of a local government’s standard budget process and without civilian (non-police) government approval. Local elected officials are frequently not involved in the decision-making, and the general public is similarly unaware of what their LEAs possess. As noted by some of the law enforcement stakeholders who contributed to this review, this lack of transparency can adversely impact neighboring LEAs in the event of an emergency when they do not know what resources may be nearby. Additionally, this lack of transparency can result in the proliferation of equipment in amounts that are often inconsistent with the size and training capacity of smaller LEAs. Federal programs for equipping LEAs lack interagency coordination and uniform standards. At present, these programs generally do not share data or reporting requirements for tracking inventory and use of equipment. Many do not monitor the transfer of equipment obtained with federal funds between LEAs. As a result, there may be no single entity in the federal government able to track particular pieces of equipment at any one time. This lack of coordination hinders attempts to hold LEAs accountable. Although some federal agencies have terminated or suspended LEAs found to be misusing funds or equipment or violating the Constitution, the impact of these penalties is likely weakened by the fact that the offending LEAs are easily able to draw from multiple other federal government sources. Federal programs supporting the acquisition of equipment by LEAs do not include standard training requirements for operation and deployment of equipment. Members of law enforcement cited the specific concern that police chiefs and those responsible for authorizing the deployment of military-style equipment often lack proper training to understand when and how controlled equipment is most appropriately deployed. It is possible that an increase in technology sharing, cross-training and increased operational relationships between LEAs and the military can foster an environment at the local level in which it is difficult to distinguish between the appropriate military use and the appropriate LEA use of the same equipment. Moreover, stakeholders expressed concern that some training programs may unintentionally incentivize the use of military-like tactics and equipment when unnecessary, and therefore, would benefit from appropriate training requirements attached to both the operation and the deployment of federal or federally-funded equipment that encourage improved policing practices. Some stakeholders who contributed to this review expressed concerns about an increasing trend toward militarism and militarization in United States policing, which can affect law enforcement culture, organization and operations. Some stakeholders felt that the “show of force” typically associated with military operations, when employed by civilian police, can weaken community trust—especially in communities with a history of strained relationships between the community and local law enforcement. Public safety and civil rights/civil liberties training may prove especially useful to strengthen community policing approaches that position law enforcement officials as trusted guardians of public safety.